How do I use MikuMikuDance? How do I make smooth motions with MikuMikuDance? How do I make music videos with MMD? What do I do first with Miku Miku Dance? How do I use MikuMikuDance? MikuMikuDance is a free 3D animation software for the PC with a huge, world-wide following! Download the latest version of MikuMikuDance from the LearnMMD Downloads page, and get started! First … move the downloaded ZIP folder to your desktop. Unzip the MMD folder: just double-click it and choose “Extract All”, and OK the defaults … and you will find the MMD folder on your desktop, ready to go! There is no install; MMD runs from its folder on your desktop. If not … there are a handful of possible issues for you to investigate. Carefully read the error statement so that you can know what needs to be done. Take a look at the Tutorial List on the right side of this page to see the many solutions that we offer. Also see the special instructions in the top area of our Downloads page. Don’t feel alone! Many beginners have a spot of trouble getting MMD to start the first time … do the research; see what you can do to get it running … or leave a comment on any of our tutorials and we will reply to your comment (or we will even contact you) with our help! … be sure the email address you leave in your comment is correct so that we can answer your question, personally. How do I get started with MikuMikuDance? What do I do first? Next you will want to go to the FILE tab and click on NEW to bring back the white, empty stage. Find the LOAD button near the lower left of your screen … in the brown area … and choose your favorite model from the list … one of the MIKUs, of course. NOW is when it gets complicated! For further instructions on the basics of making Miku move, of “doing” MikuMikuDance, see our Start Here page! See LearnMMD’s HOW TO page for a list of links to our tutorials that will help you find out what you want to know … what you NEED to know as you work with MikuMikuDance. Also see our Bonus Pages page for links to some of our hard-to-find tutorial pages! What do I do with MikuMikuDance? Most new MMDers discovered MikuMikuDance by seeing some of the tens-of-thousands of MMD videos on YouTube … and they think they’d like to try it for themselves. Once they have MMD running on their desktop, they discover how complicated it can be! … just calm down and take it easy. Yes … MikuMikuDance is complicated if you want to make your own animations from scratch … but there are EASY ways to use it, too! The easiest way to make an MMD animation and video is to use a meme (rhymes with seem). LearnMMD has a meme that you can download right from our Downloads Page … the “Happy Hands” meme. Find it on our downloads page, download the Happy Hands zip folder, unzip it … and you will find files for the music, the motions, and even a background image: Pink … See the full instructions for doing the Happy Hands meme. 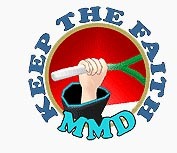 Search YouTube for MMD meme and you will find many videos that include download-links to the meme files. Many MMDers enjoy “making pictures” with MikuMikuDance. Just open MMD, load your models, your stage, your accessories … pose everything to look just the way you want it … and “take the picture”. MMD, under the FILE tab, has “Render to Picture file(B)” … which lets you save the image you see as any of several picture file formats. I like to capture my OWN images by using the Print-Screen button on the upper-right of my computer’s keyboard. That puts the screen image into the computer’s clipboard memory so that I can PASTE it into a window in my Photoshop, GIMP or Paint program. See the LearnMMD tutorial Make a Music Video with MMD … to see what’s involved in downloading the files you will need as you make an MMD music video. Search YouTube for the title of the song that you want to do … and include the word LINK in your search … like: MMD World is Mine link … to find MMD videos that may include links to the various music and motion files that you will need. You would download those files and put them together in MMD to create your own version of that song’s MMD video! … You will need sets, stages and accessories … and a bit of “know-how” as you put things together and customize them to suit your needs. Learning the “know-how” is all part of the fun! As you work on your animation, you will come across MANY exasperating problems … just keep at it … stay with it … and you will get everything to work! Send me a link to your first video! What every MMDer is dreaming of when they open MikuMikuDance for the first time! … before they find out what they have gotten themselves into! Creating 3D animations from scratch is a complicated business … but I find it fun to learn. I have been running MMD for over three years and I am still learning how to do it! LearnMMD.com has a ton of tutorials (over 300) that explore many of the things you will want to know as you progress in the art of 3D animation. Most important … Don’t give up! Enjoy the process of learning MikuMikuDance. So complicated, so many details … such satisfaction as you learn something new about it. Have you seen the Kamen Rider Drive opening Vocaloid version on Youtube? It’s really awesome! I wonder how the creator made that video. I want to learn to make that kind of video. Do you know how? I want to add something. Can I do something like putting the Kamen Rider opening video into MMD and just add more things whenever necessarry? 1) Load the program and open it. 7) If not satisfied, return to #3.